Speak or strike? Obedience = faith? Take the staff and assemble the congregation, you and Aaron your brother, and TELL the rock before their eyes to yield it’s water. Moses and Aaron go out…they gather the congregation by the rock and for some reason Moses makes a seriously bad decision…he doesn’t TELL the rock, he STRIKES the rock….TWICE. Now, when I first read this, I was thinking…ok big deal. So he didn’t do exactly as the LORD instructed. I mean he has been instructed to bang the rock before to make water (Ex 17:6) and it worked this time again, so ? Because you did not believe in me, to uphold me as holy in the eyes of the people of Israel, therefore you shall not bring this assembly into the land that I have given them. Holy Moses. (sorry I couldn’t resist) Because of that “little” mistake God bans Moses from the promised land?! The end goal of all this wandering is to get to the promised land and now, Moses just disqualified himself. Anger – it’s kinda well known that Moses has an anger management problem. (Remember the first tablets of stone?) The fact that he strikes the rock, not once…but TWICE, probably indicates that he was ticked off. Moses, gives in to sin in the midst of intervening for the people – gives in to self…and therein directly disobeys God. How many times do I give in to sin, even in the midst of “serving him” and selfishly chose to react with anger, bitterness, gossip? Assumption – we all know the saying about what happens when we ‘assume’….perhaps Moses assumed that because he had smashed the rock before with his staff and made water come out that this is “probably what God meant, so I’ll just do it this way.” God had given him explicitly clear instructions, and he didn’t follow them. God gives us explicitly clear instructions in his Word, the Bible, how often do we “sort of” follow them? Is it even important to us to follow the instructions in his word or do we think we have wiggle room? Have we rationalized certain sins – even the ones that are strictly prohibited in the Bible – and keep them around and assume that God is ok with them? Listen carefully – God is never OK with sin and his will for us will NEVER include sin. Don’t be deceived. Follow God’s instructions in his word – submit your life to them and be changed by them…DAILY. If this is resonating, if you feel God’s Holy Spirit moving within you – run…do not walk…run to Him. Get on your knees and repent with sorrow for the sin of unbelief, a lack of faith..and everything that goes along with it (like #2 and #3)…ask God to forgive you by the action of his Son on the cross and the resurrection God has given. He will forgive you and you will be free. 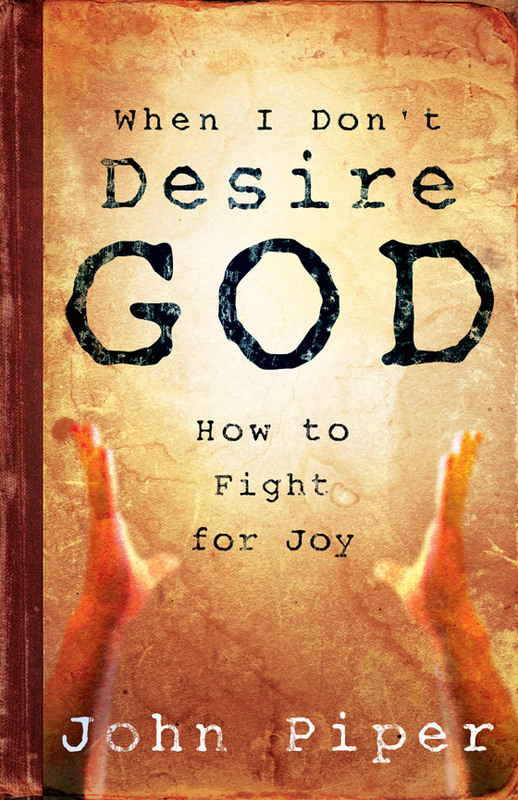 THEN, also run…do not walk…to the nearest computer and order a copy of “When I Don’t Desire God” by John Piper. (I say go to the computer because the odds of finding it in a “Christian” bookstore are pretty slim…you usually will only find very lame, weak, man-centered books on how to find your joy in cheese these days in most chain Christian stores….sorry…did I just say that out loud?) . Crawl up by the fire and read the whole thing. What you will learn is that we first need to find our treasure, our joy, our satisfaction, in God alone – he is the only thing that will truly satisfy us. That’s the way he made us. Get to know this God, read good books about GOD, his nature, his attributes, read the WHOLE Bible and see his hand throughout redemptive history…and in that you will find rock solid joy in a rock solid, unchangeable, eternal, infinitely good God. Here have a taste of Piper….on the house…. …having a spiritual taste for the glory of Christ is not morally neutral. Not to have it is evil and deadly. Not to see and savor Christ is an insult to the beauty and worth of his character. Preferring anything above Christ is the very essence of sin. It must be fought. UPDATE: I also read a great bit in “Milton Vincent’s ‘A Gospel Primer for Christians’ that really helps us understand here too…. Every time I deliberately disobey a command of God, it is because I am in that moment doubtful as to God’s true intentions in giving me that command. Does He really have my best interest at heart? Or is He withholding something from me that I would be better off having? Such questions, whether asked consciously or not, lie underneath every act of disobedience. However the gospel changes my view of God’s commandments, in that it helps me to see the heart of the Person from whom those commandments come. When I begin my train of thought with the gospel, I realize that if God loved me enough to sacrifice His Son’s life for me, then He must be guided by that same love when He speaks His commandments to me. Viewing God’s commands and prohibitions in this light, I can see them for what they really are: friendly signposts from a Heavenly Father who is seeking to love me thru each directive, so that I might experience His very fullness forever.